The student of the month is a very quiet but outstanding role model for her peers. She is always nice to others and I have seen her repeatedly go above and beyond for her academics. She does what is asked of her and never needs a reminder to do anything. 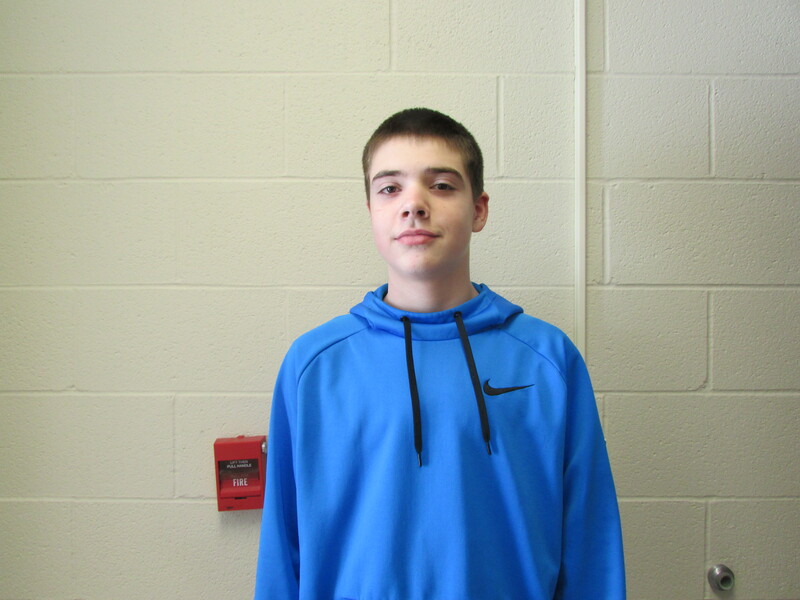 The student of the month is also very mature for the 7th grade and has been a pleasure to have in class all year! I see the student of the month in science and intervention periods. She works hard in both. She is quick to help others and diligent in working hard all period. She will hopefully use these skills in her future career in public service as a police officer. Good luck in your future career ambitions! Fun, positive, intelligent, supportive. That is how I would describe the student of the month. She handles every issue, every confrontation, every problem with the same positive demeanor and is never afraid of adding a little humor to a situation. Grit isn't defined by attacking every problem, it is defined by properly defining what a problem really is. The student of the month has a knack for this that make everyone around her stop and think about their own priorities. 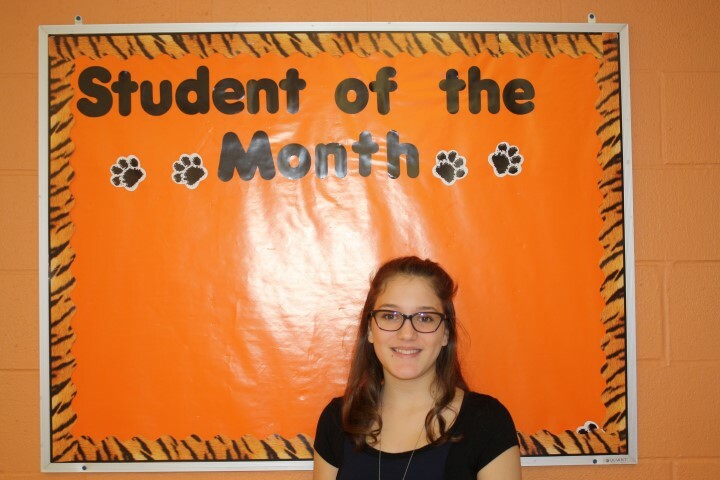 The student of the month deserves to be recognized for her efforts in maintaining an A in both Language Arts and Reading for the entire school year. She is on-task at all times and is clearly engaged during classroom discussions. 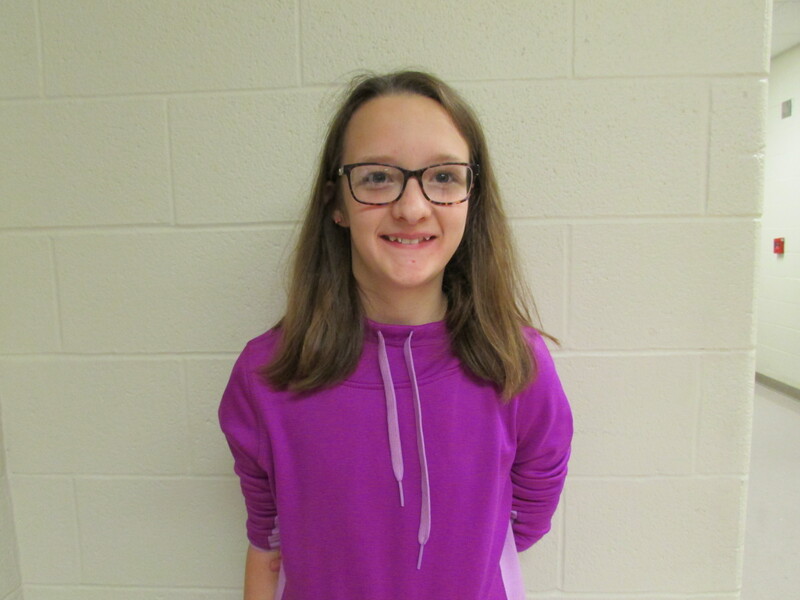 Moreover, the student of the month is very friendly and out-going, and serves as an excellent role model for her fellow students here at Newton Falls because she exemplifies outstanding character inside and outside the classroom. The student of the month is such a hard worker and I can always rely on her to not only complete her assignments but help others around her who may be struggling as well. She's always positive and willing to learn and I appreciate her enthusiasm for school! The student of the month always has her hand up and is ready to participate in first period when many are still pretty quiet and sleepy. I appreciate her gentle demeanor and positive attitude towards her classmates. The student of the month never needs to be asked twice to do something-she gets right to work and puts in her best effort. She will help those around her and is a great leader in my classroom. The student of the month is always prepared for class, never late, and never misses an assignment, She goes above and beyond to study additional materials. She is always quick to volunteer to help others learn in class and makes an effort to be kind to all students. She exemplifies exceptional character outside of the classroom at school events. 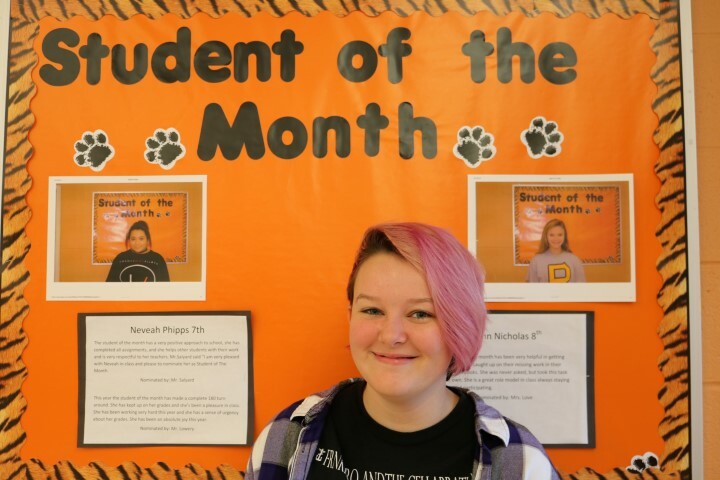 The student of the month is a quiet role model for her peers. She always has a smile on her face as she enters the room. She is good-natured and pleasant to be around. The student of the month works diligently on her academics and seems to really care about her schoolwork. I also love having the student of the month in class because she can sing the Periodic Table song verbatim! The student of the month is so focused on her academics while in class. She seems very mature for her age and she seems to stay out of the "drama" that can often accompany this age group. I appreciate her gentle demeanor and love having her in class! The student of the month uses class time wisely. She does her best to avoid distractions in a very distracting class and is always willing to explain a concept to other students if they ask. Math does not come naturally for her and she has to work hard to understand the material and she always puts forth her best efforts. The student of the month is also an extremely kind and caring person. I have never heard a bad thing come out of her mouth. 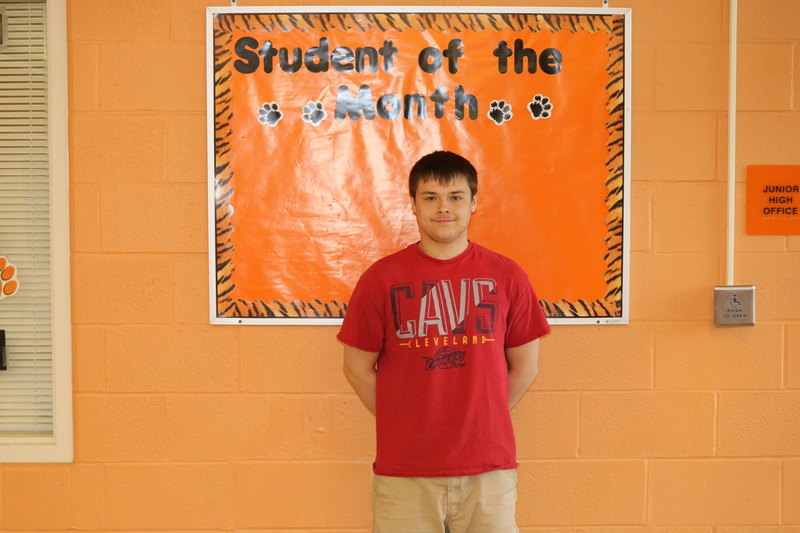 The student of the month is a model for academic excellence and behavior in the classroom. She has maintained an A in both Reading and Language Arts for the school year thus far. 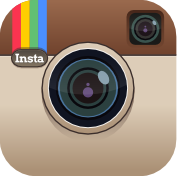 In the classroom, the student of the month is always engaged in the lesson and participates in classroom discussions. I can't think of a better representative of the best that Newton Falls has to offer than her. 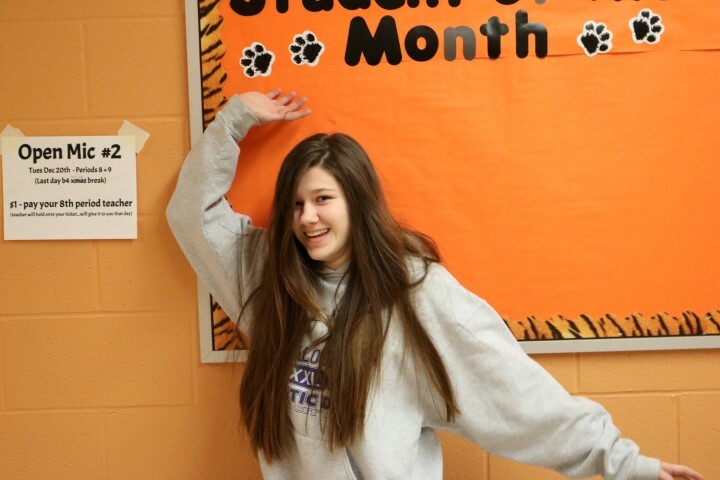 The student of the month goes out of her way and gives everything she has to excel in all aspects of her life. She is a dedicated and hard working athlete and displays her kindness and sense of community by giving back. Having created gifts for the seniors on sports teams and treats for underclassmen athletes. This sense of hard work and commitment is also demonstrated in the classroom. In a class full of all boys, literally, she maintains her composure, focus, and commitment to her school work having achieved A's in all three semesters this year. 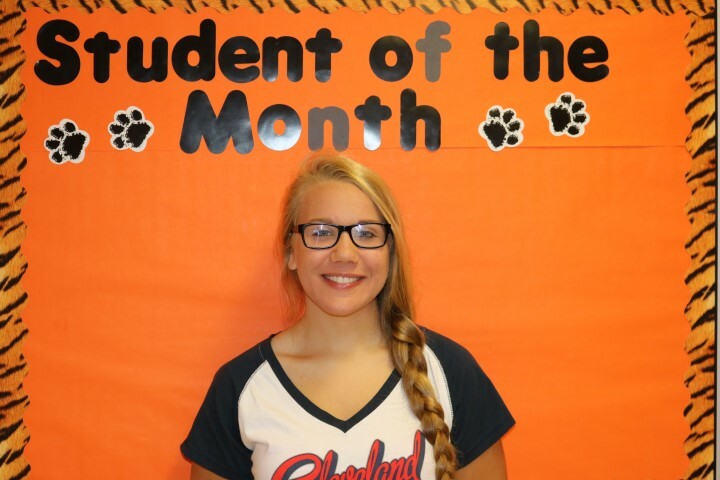 The student of the month is one of those individuals that attacks everything she takes on with a 100% effort and a commitment to be the best at it. She's well deserving of this honor. 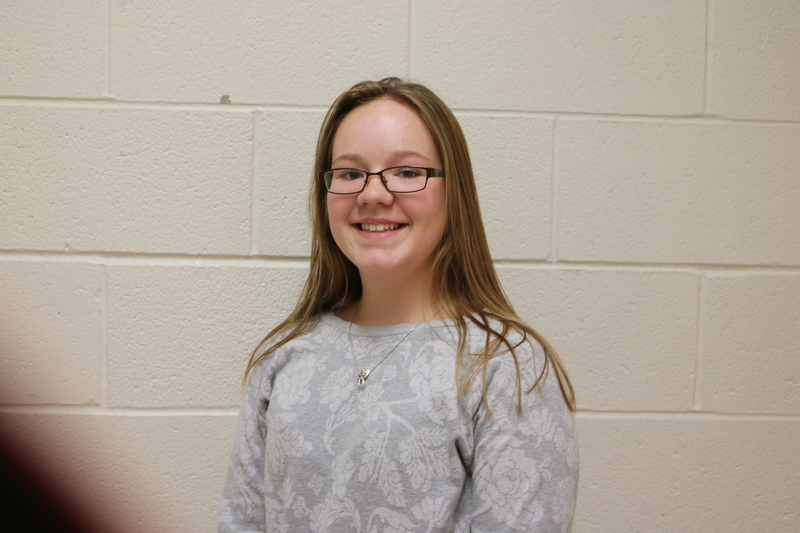 The student of the month’s personal qualities are just as impressive as her intellectual accomplishments. 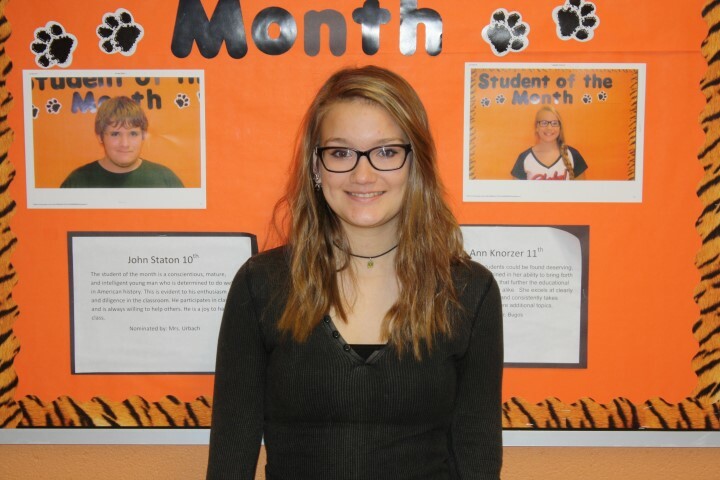 The student of the month is an extremely kind, sensitive and sensible young woman. She is a very goal oriented student and her organizational skills are superlative. The student of the month often goes above and beyond the Honors Level Curriculum. In my study hall, the student of the month always helps his classmates with homework, especially math. It seems that every day, he is leading a small group of his classmates through their prior night's assignment. He gladly offers his expertise to anyone who asks. The student of the month has maintained an A in English and Reading so far this school year and is a very well-mannered and respectable young man. He organizes his planners and binders exactly as directed and turns every assignment in on time. He also contributes to class discussions and serves as a role model for his peers. He is a pleasure to have in class and I look forward to watching him continue to succeed throughout his school career. The student of the month loves helping other students in class. He often encourages and explains content to students. He is respectful to other students and respectful to me. He has high standards for himself. He has made progress in my class in that he knows he is very disorganized and asked for help concerning his binder. We have a contract. When I pass out documents that must be in his binder, I check his binder to make sure that they are there. This takes pressure off of him. He hands in his work, but now he is not digging around trying to find it. I highly recommend him for student of the month. The student of the month's hard work in class immediately caught my attention. She stays on task and gets her notebook set up, then will look around her table to see who needs help. She is a quiet leader and demonstrates this to her peers daily. The student of the month comes to class with her homework complete and ready to learn. I admire the student of the month's work ethic. Keep it up! 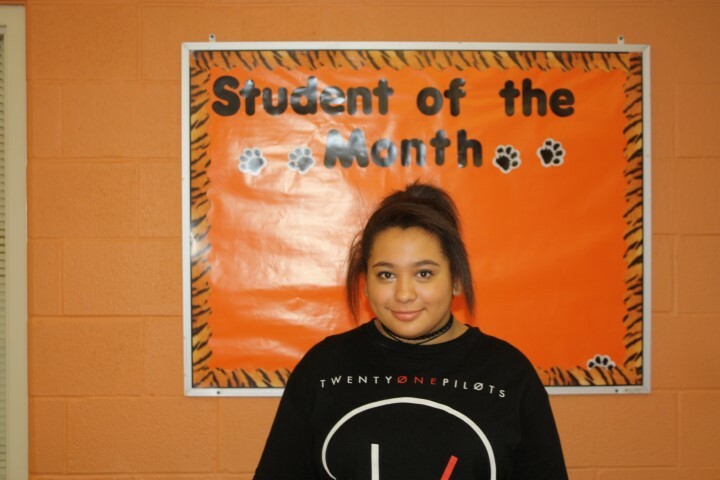 The student of the month is an exceptional student who has earned an A in English and Reading since the beginning of her 7th grade year. She is a positive role model for her fellow students and always comes prepared for the classroom. Moreover, the student of the month has a radiant smile and personality that truly shines wherever she goes. The student of the month's future is certainly bound to be bright and I can't wait to see her flourish in high school in the coming years. The student of the month has really improved in the last month in getting his homework complete. I have noticed him putting forth more effort in class as well. As a teacher, it is nice to see students adjusting to areas that need improvement and putting in the work that needs to be done to improve. Thank you for making the improvements that needed to be made! The student of the month comes to school everyday to work and to learn. It is rare to ever see her not smiling and bringing a positive energy to the classroom. She works harder than any of my students in a very challenging course. The student of the month is the epitome of the ideal student. She strives to go above and beyond in almost every assignment she completes. Her work in English class is precise, articulate and thoughtful. Beyond her exemplary academic performance, the student of the month is a role model for student behavior and participation in class. The student of the month is a great role model for his peers in my classroom. He is meticulous about his work and pushes himself every day. In addition, he always comes to class with a smile on his face and is a ray of light for all those that surround him. I am lucky to have a student like The student of the month in my class this year. The student of the month consistently goes above and beyond the honors level curriculum. The student of the month enjoys being challenged academically and shows the grit to be successful in any given situation. The student of the month has worked very hard throughout the entire year! She has brought her grade up to the highest in the seventh grade for the fourth nine weeks. She participates in class and is always ready to start the day! 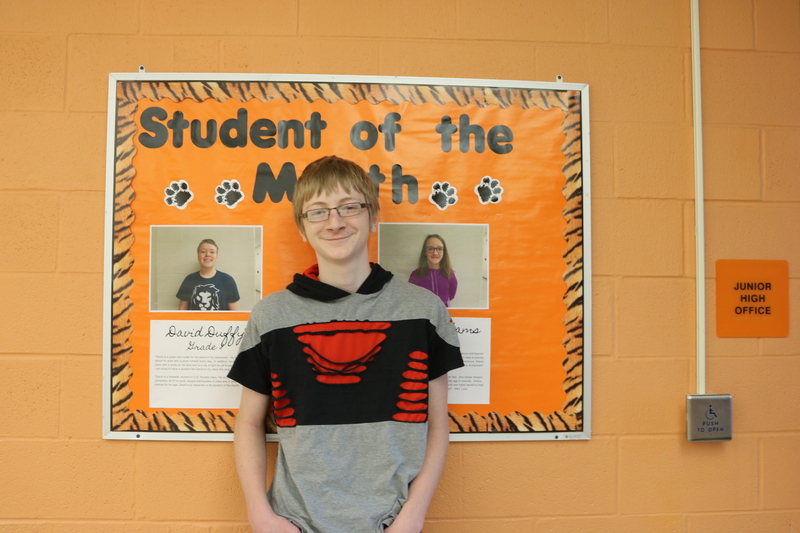 The student of the month has maintained an A/B average for the entire year. She is a very hard worker and sets a good example for her peers. She is also very pleasant to have in class. She treats others with respect and has wonderful classroom attitude and behavior. 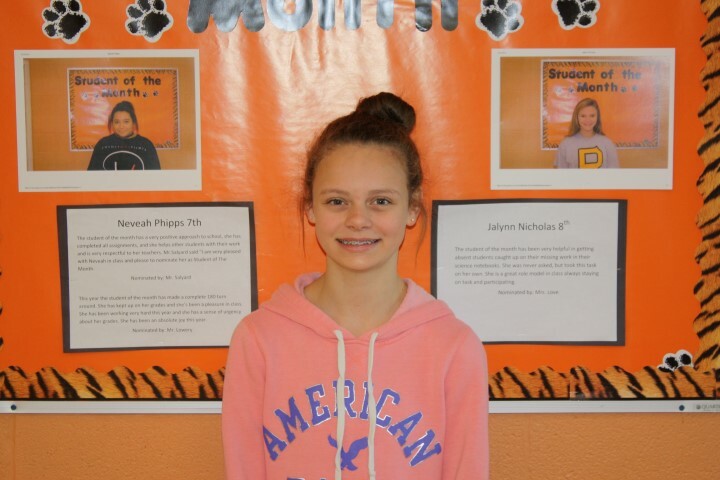 The student of the month has been a positive role model to her peers all year long. She is a quiet leader and deserves recognition due to her ability to draw positive attention her way. I love that she spends time on her assignments and turns in her best work. Her artwork is an added bonus for my science class. I always look forward to seeing what she has put her artistic stamp on when handing in work with drawings or color! I am nominating the student of the month not for his previously outstanding work, but for his growth. As a student, he has made considerable strides towards understanding the material and content, and his participation in class has increased significantly since the beginning of the year. 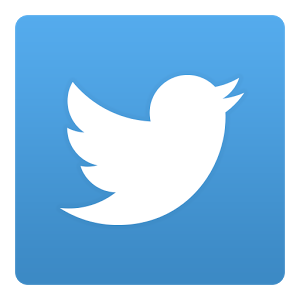 He is active, inquisitive, and creative in his approach to learning and understanding my content. His growth will undoubtedly grow as he continues on his endeavors, but his presence in my class has made my room a better place to learn. 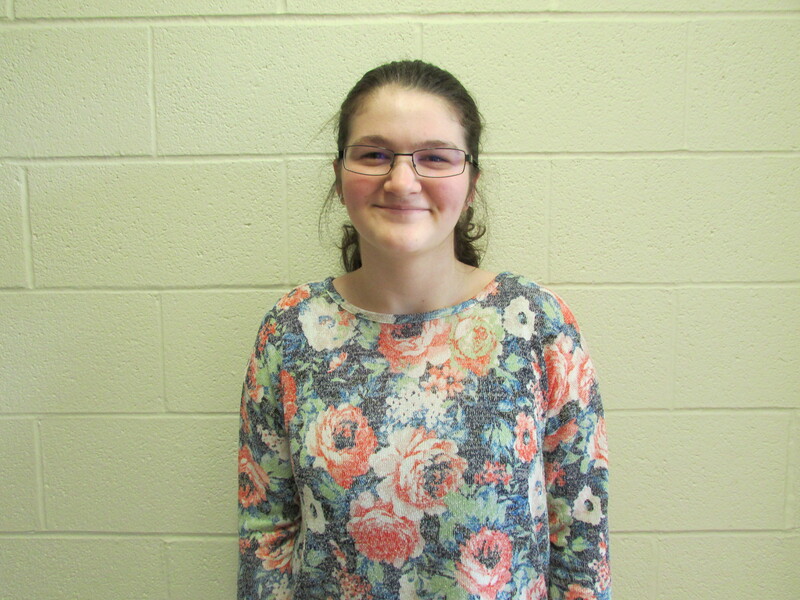 The student of the month has gone above and beyond to be a paradigm for her peers. She is always prepared for class and ready to learn new insights. Her positivity is influential in the classroom. The student of the month is a great student. He is very good about getting all of his work done. He is also very helpful in class. He makes sure that he erases my board and changes my date for me after class. The student of the month is such a nice person. I see her quietly helping others, so as to never distract from the rest of the class. She is funny, smart and a real ray of sunshine at the end of the day! The student of the month is a great student in U.S. Studies class. She is a straight A student, participates often in class, is very respectful and very well behaved. She is an 8th grade student that really sets an example for other 8th graders to follow. Also she is someone who exemplifies a true student of the month and it is a privilege to have her as one of my students in class. The student of the month is something of an unsung hero. He is a quiet, focused student, but over the course of the year he has grown significantly in his confidence, becoming more engaged and active in his learning. He is checking his understanding of material often, growing more supportive of his peers, and showing outwardly his congenial demeanor, something he masked at the beginning of the year. The student of the month is a rare student, driven by intrinsic motivations to perform with excellence in any undertaking she chooses to grant her attention. 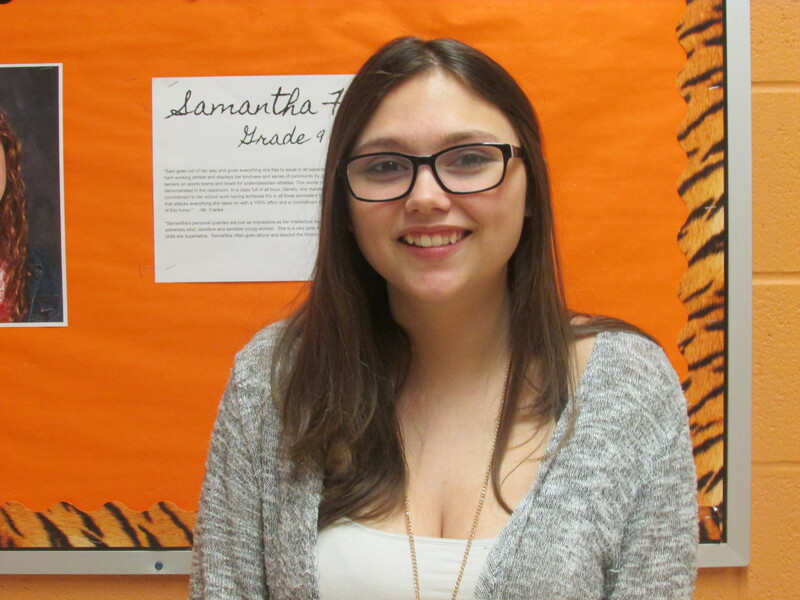 Her dedication to self-improvement is certainly evident in the classroom, and her ability to communicate with peers and staff is nothing short of exemplary. The respect and dignity in how she treats others would be commendable for an individual of any age. 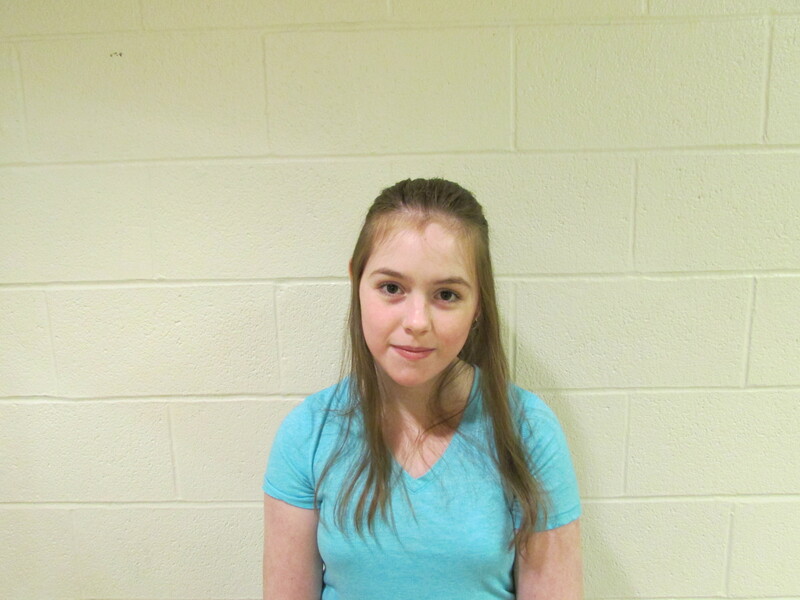 The student of the month has maintained an A/B average in language arts and reading so far this entire school year. In addition to being very bright, she is a pleasure to have in class and serves as a role model to her fellow students. 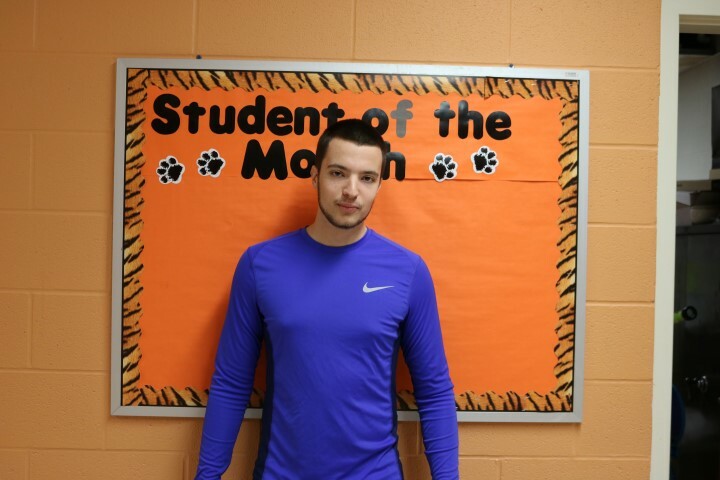 The student of the month has a genuine heart and he models that in class daily. I’ve never heard him say a negative comment about anyone and he helps others without being asked. What really makes him stand out was when the class received a movie day award and he wanted and completed the assignment anyway. He is a great role model for his peers. The student of the month is in many ways an ideal student, but it is his effort, every day without fail that is worth special praise. No matter the content, no matter the day, no matter how his peers react, he is always eager to examine and explore the content in my class. He is engaged and motivated, and spreads his motivation to the students around him every single day. This sort of effort is a very rare trait in students and I am privileged to have his full effort every day. I can rely on him to push and promote learning in my room, no matter the circumstances outside of it. 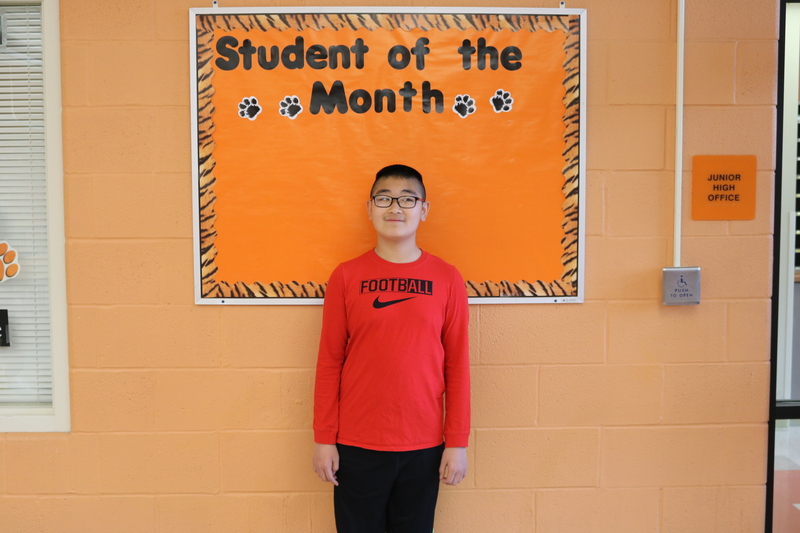 The student of the month has an impressive grasp of new material which allows him to provide feedback, humor and positive candor in a classroom environment and assists all around him in their pursuit of knowledge. He is an ally to any teacher wishing to promote conversation in the classroom and readily applies himself to new challenges with diligence and composure. The great respect he shows to all has made him a well-respected student, classmate and peer. The student of the month is a wonderful student. Completes work on time and completes all assignments when necessary. She is willing to help others during intervention and is always on top of what she needs to do! 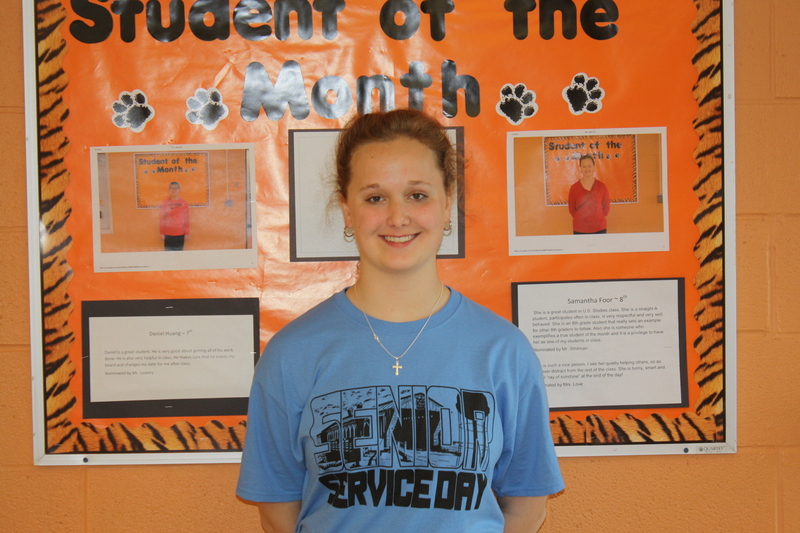 The student of the month is a very kind young lady that often brings a smile to the classroom. She always walks in with a positive attitude ready to work. When she doesn’t understand something she always asks for clarity which is important in the classroom. 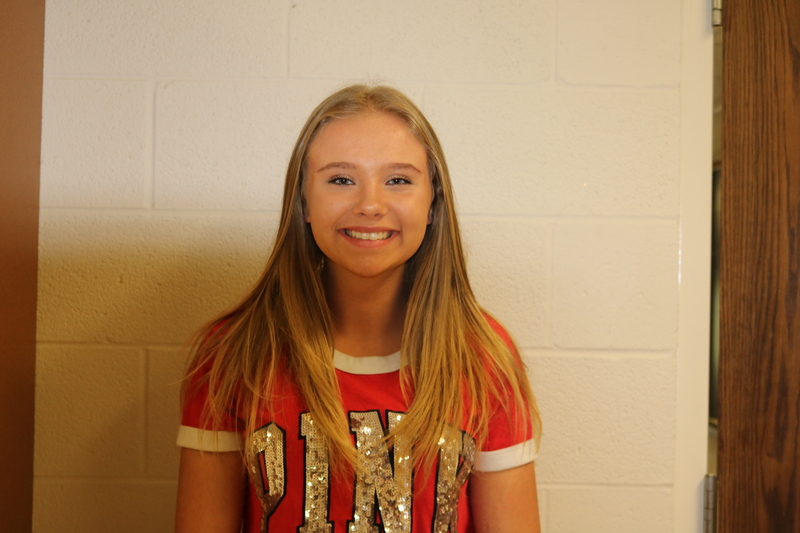 In class she always tries hard on her assignments and tests, offers to help her peers, pays attention to instruction, and overall has a great attitude in the classroom with a positive outlook on the education setting. The student of the month possesses two very important characteristics needed for successful studies: curiosity and drive. In the second nine weeks, he transitioned from a quiet student seeking to fly under the radar to an active and vocal member of class. He has taken his natural curiosity and drive and uses them to enhance the learning of others around him through his compelling commentary and insightful questions. He is a true benefit to our class. The student of the month is diligent about his academic work; he shows strong initiative to complete laboratory work correctly and assumes responsibility when working in group format. He has developed excellent problem-solving skills along with a positive work ethic over the last six academic months I have known him. In the classroom and outside the classroom he practices disciplined work habits to help him succeed in any task he is trying to accomplish. The Student of the Month has been an absolute delight to have in class all year. She is attentive and engaged every class period. She works very hard and always has one of the best grades in my class. She is also the kindest student in 7th grade that I have ever met. She always goes out of her way to find me at the end of the day to tell me to have a good day. If there was a student of the year I think it would have to be her. The Student of the Month is a very focused, hardworking student. He is kind and has respect for his classmates and teachers. He is an excellent example to the other students. The student of the month has excelled in my class the past month getting perfect grades and going above and beyond in her assignments. The student of the month often times takes the time to help other students study or understand concepts better. She is a model student, and one our school district can be proud of. Leadership is not about telling but rather listening. This basic principle of leadership has been exemplified by this year’s Student Body President and Senior Class President as they directed and completed the best Veterans Day Event at Newton Falls High School. Their task was of outstanding energy, enthusiasm for the program, and to direct a multitude of ideas and methods of participation into a coherent theme of inclusiveness, love, respect and celebration. I tip my hat to this year’s senior class and their outstanding chosen leaders, these students of the month. They are both deserving of the Student of the Month. The student of the month is a fantastic student in 8th grade U.S Studies Class. She is an A student, always participates in class, has a great attitude and shows maturity in her behavior in class. She is a role model for other students to follow and is a great representative for student of the month. The student of the month is one of the hardest working students I have ever had as an art teacher. Combined with this high work ethic, is outstanding talent. This combination brings great success. I appreciate how she is consistently working on all of her assignments, as well as keeping her peers on task. She sets such a positive tone at her table. This student arrives to class daily with a smile and is always filly prepared to learn. In addition to these wonderful attributes, the student of the month volunteers daily to assist both me and the students with any task. He is an asset to the class and continually brightens each day for me; I can always count on him! 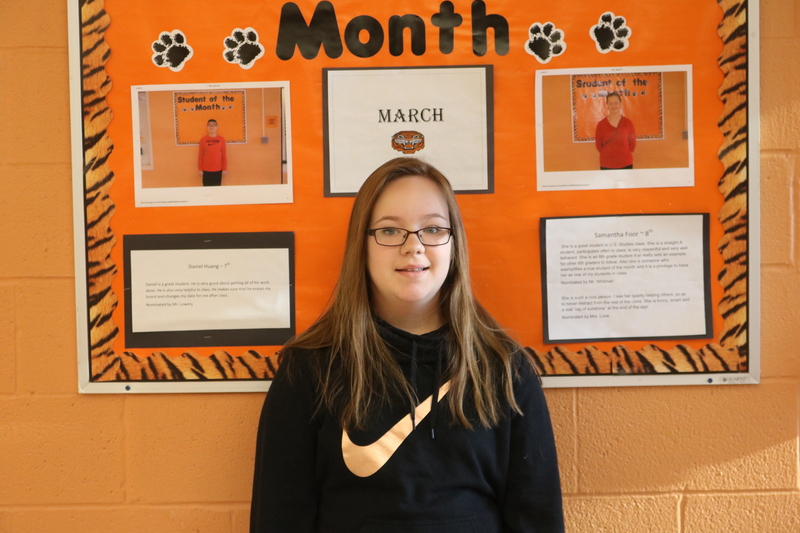 The student of the month has a very positive approach to school, she has completed all assignments, and she helps other students with their work and is very respectful to her teachers. 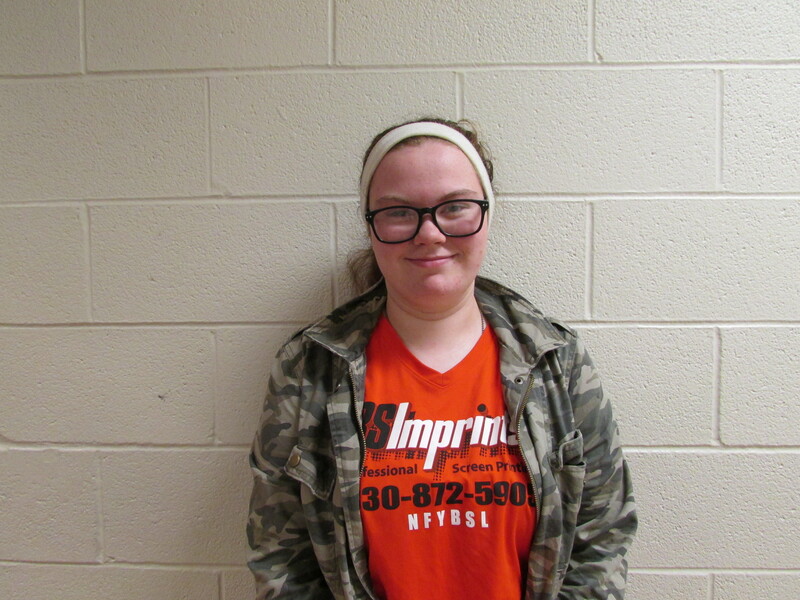 Mr. Salyard said “I am very pleased with her in class and please to nominate her as Student of The Month. This year the student of the month has made a complete 180 turn around. She has kept up on her grades and she’s been a pleasure in class. She has been working very hard this year and she has a sense of urgency about her grades. She has been an absolute joy this year. The student of the month has been very helpful in getting absent students caught up on their missing work in their science notebooks. She was never asked, but took this task on her own. She is a great role model in class always staying on task and participating. The student of the month is a conscientious, mature, and intelligent young man who is determined to do well in American history. This is evident to his enthusiasm and diligence in the classroom. He participates in class and is always willing to help others. He is a joy to have in class. 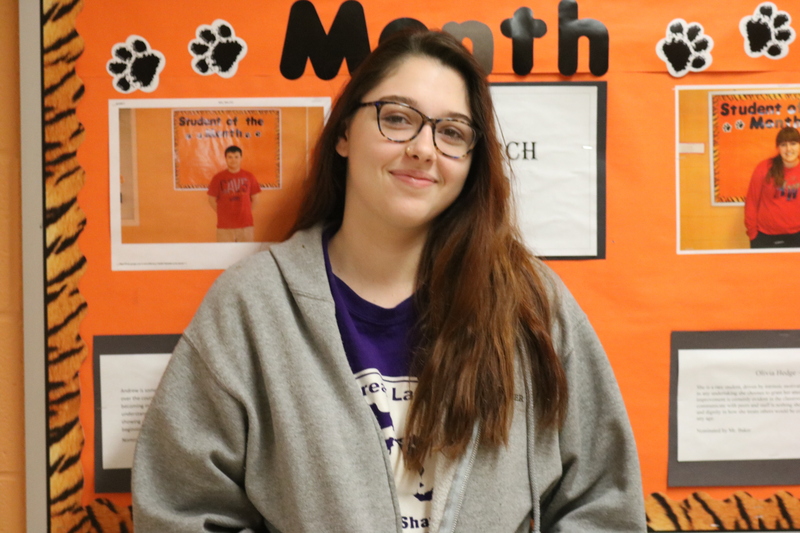 In a year when numerous students could be found deserving, the student of the month has shined in her ability to bring forth questions and issues in the class that further the educational experience of student and teacher alike. She excels at clearly stating alternative views of issues and consistently takes advantage of opportunities to explore additional topics. The student of the month is an excellent student. She always excels in whatever she does. She tries to do her best and it shows. She is on time with work and to class. She has a personality that makes it easy for any student and teacher to want to be around her. When given an assignment, she will initiate what needs to be done if it is on her own or in a group setting. She is a leader, good student, and a sweet girl. The student of the month is one of the hardest working students I know. She is also a very good reader and has good ideas. She enjoys history and is very analytical worker applying what she has learned. The student of the month is an extremely hard-working and dedicated student in my class. She is always happy and pleasant and with a cheerful mood is contagious. She is always prepared and one of the first students to offer answers and engage in academic discussion. She’s extremely mature and is kind/compassionate to others. She is a great and deserving student. 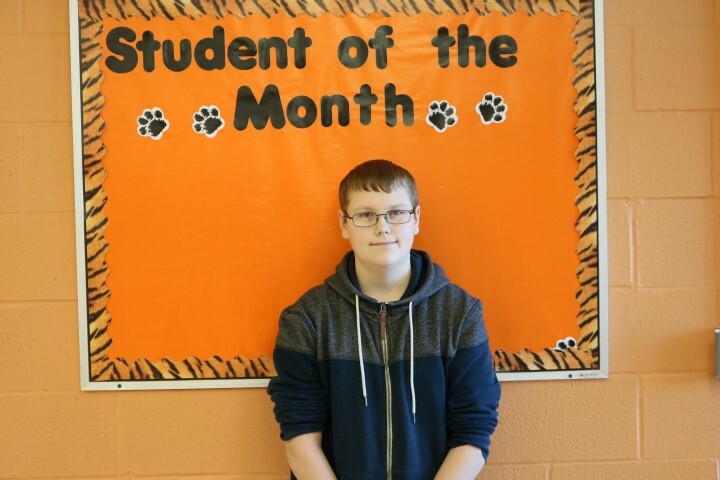 The student of the month consistently brings a positive attitude in class and strives to advance in classroom discussions by looking at old issues in new ways. Hard working, consistent and analytical, she is a joy to have in class. The student of the month is a very hardworking student. She does her best on everything she does. She turns in all classwork and homework on time and asks questions when she doesn't understand something. She also attends after school intervention every day that it's offered. She has excellent attendance, turns in all assignments, and is a curious, involved student. The student of the month I feel exemplifies all the qualities of a distinct student. He is always respectful, polite, prepared for class, and willing to help others. He is never disrespectful and loves to be an active participant in class by volunteering during class discussions and going to the Smart Board. I greatly enjoy having him in my class this year! He is so caring with students that need extra help. He works really hard in class and genuinely cares about his grades. He is one of the kindest students I’ve ever had the pleasure of teaching. The student of the month is probably one of the hardest working students I have had over the course of all of my classes. 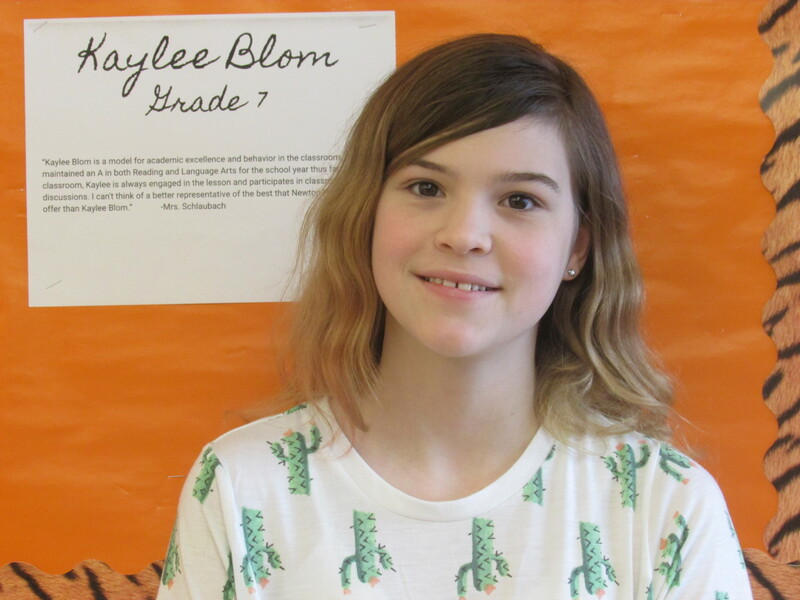 She has an exceptionally positive attitude that permeates throughout the entire classroom. When faced with a challenging problem, she is very comfortable asking questions and clarifying the material so she can be successful. I am regularly impressed with her work ethic and her demeanor. She consistently completes all of her work at a high level, and regularly earns test scores at or near the top of all of the geometry students. In addition, she is commonly found assisting her fellow students with problems they may be struggling with. She is a natural teacher, and her peers respect her for her abilities and her willingness to help. I am pleased to nominate her for this honor. The student of the month consistently contributes to the classroom environment by providing analysis of complex issues in a calm and often humorous manner. His critiques of material allow himself and others to explore concepts and assist instruction. I appreciate having him in class for his insights, opinions and grasp of material. The student of the month is an absolute pleasure to have in class and has maintained straight A’s all three semesters. She always participates in class and she is the first to help a fellow student in need. I wish her love of learning was a virus the whole student body could catch. The student of the month is in my first period class and she’s never “too tired” to help others. She is the “Mother Hen” in her area and helps me a great deal. She is kind, polite, and seems like an unsung hero who is owed for her due for all that she gives to those around her. 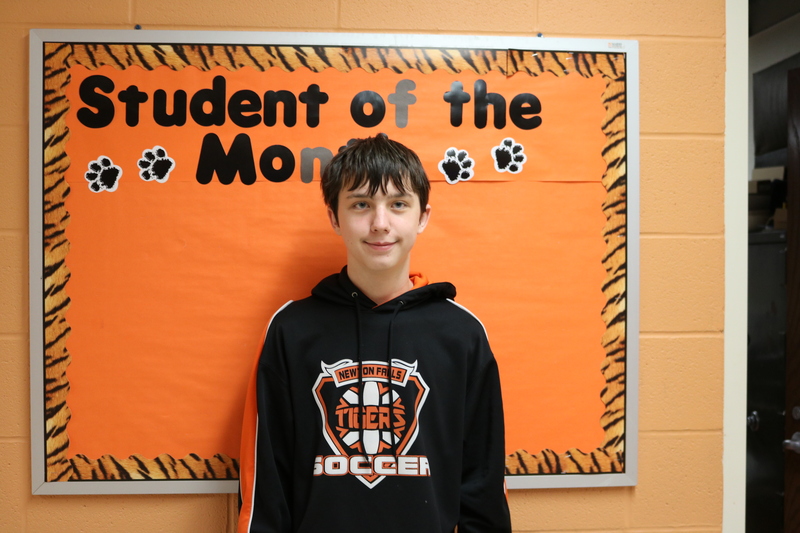 The student of the month is the very essence of a student who strives to go above and beyond. In her studies, she works hard to ensure her mastery of the content, always seeking out ways, independently of my instruction, to strengthen her understanding. She will do additional assignments, ask me for other resources for content being taught, and otherwise ensure nothing less than he perfect comprehension. Additionally, she is unafraid of sharing her finding with her peers, in a way that is positive and respectful of the class environment. She exemplifies the ideal student, in that she is every day giving her all to fostering understanding and growing as a person. Additionally, she is courteous, thankful, and cooperative with her peers, and most importantly, driven. It is because of her drive, and her refusal to settle for anything less than her best, that she should be awarded the student of the month. The student of the month is extremely deserving of the student of the month nomination. He always has a positive attitude and is one of the first students to offer his help whenever I need it. He’s really stepped up in yearbook and is leader and helps others around him with photography projects or anything else that he can. He has a job and works long hours while also maintaining his responsibilities at school. He always tries to lift people’s spirits up and I truly appreciate the positive energy he brings to my classroom. The student of the month has maintained straight A’s for the entire year so far in Language Arts and Reading. She is a pleasure to have in class and a role model for other students. The sky is the limit in her future! 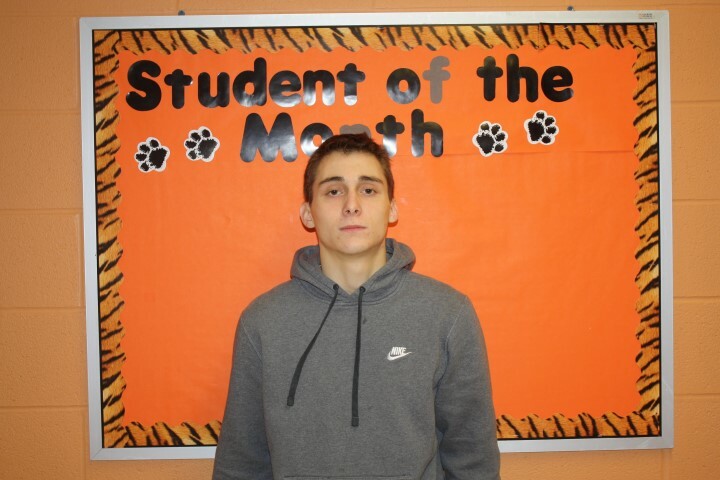 The student of the month is a great example of a student athlete here at Newton Falls. She always puts the student side first. 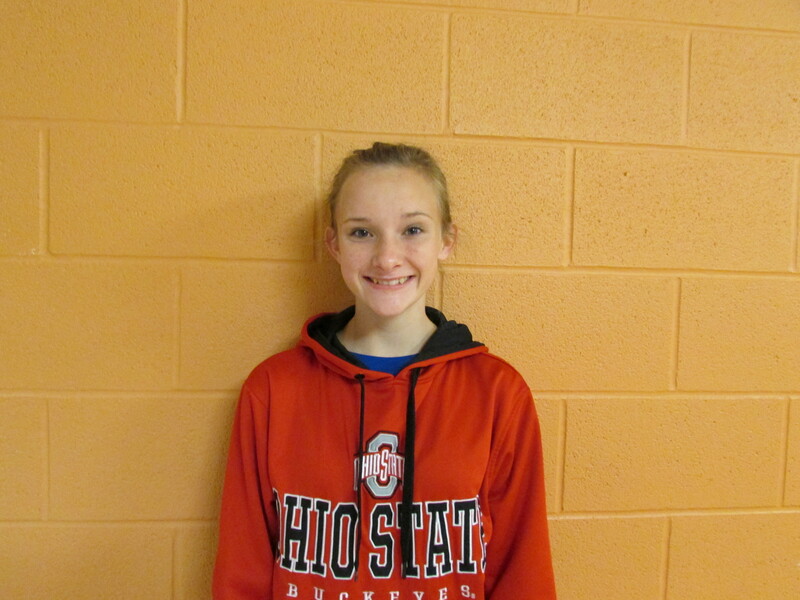 She has been able to maintain excellent grades while playing sports throughout the school year. She is also a great example of how students should treat each other here at Newton Falls. She is friendly and outgoing to all of her fellow students. The student of the month is super polite, always on top of her work, and is very focused in class. She’ll help others and is a leader in a crowd. She has a good head on her shoulders and doesn’t do things just because it is trendy. The student of the month is like my right hand! I can count on her to help me with anything. She’s always prepared and is extremely responsible. She has a great attitude and motivates others around her to do better. She is an amazing student and I’m proud of the hard work she demonstrates. 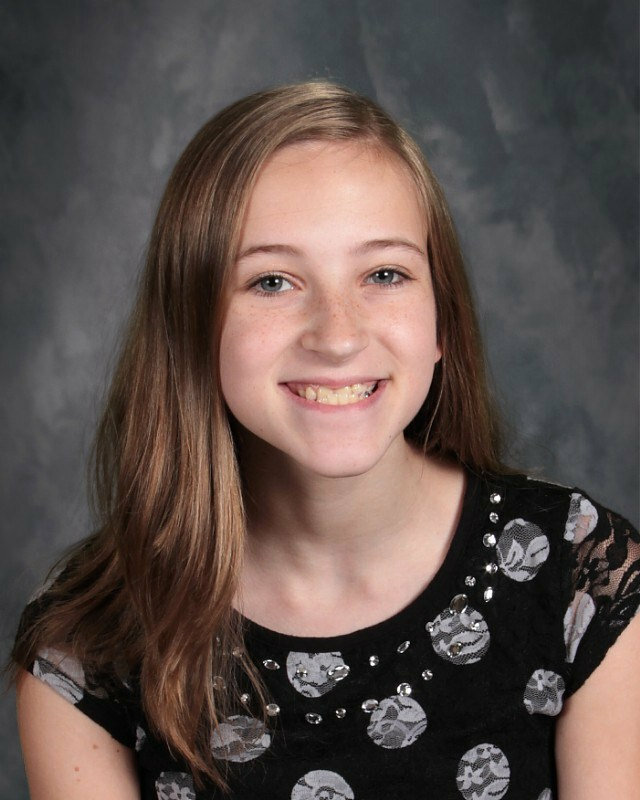 As her teacher at Newton Falls High School I have had the opportunity to witness the growth of the student of the month's strong academic, organizational and social skills over the past 4 years. 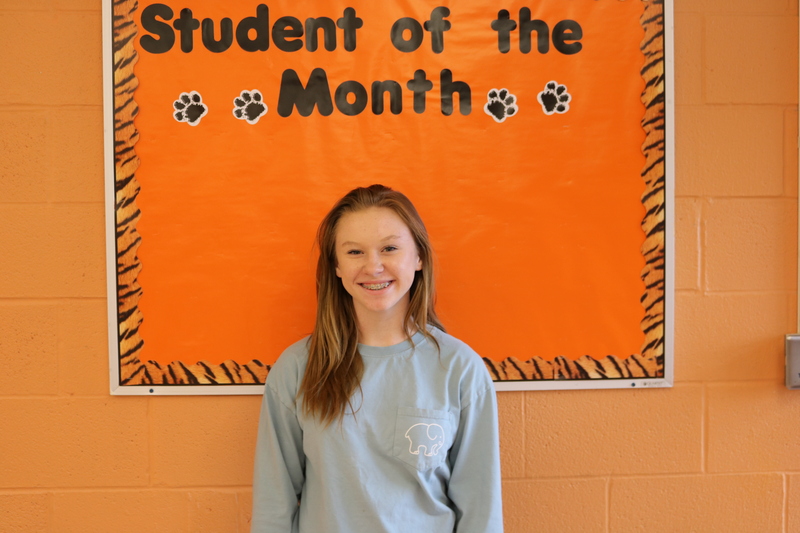 The student of the month is a highly self-motivated student who exhibits natural leadership ability as well as a great curiosity about the world around her. She requires very little extrinsic motivation and gravitates towards any activity that requires leadership or answers her boundless curiosity. Her natural leadership ability has combined with a keen intellect and outgoing personality to create a student who will, someday use her abilities to better the lives of others through her chosen career path. I would like to nominate a wonderful person for student of the month. He consistently participates in class by challenging information in a way that adds to the dialogue and learning of all students. He, simply put, makes all around him, including teachers, better at the job they do by consistently questioning the world as it is presented to him. This is what academia should be. 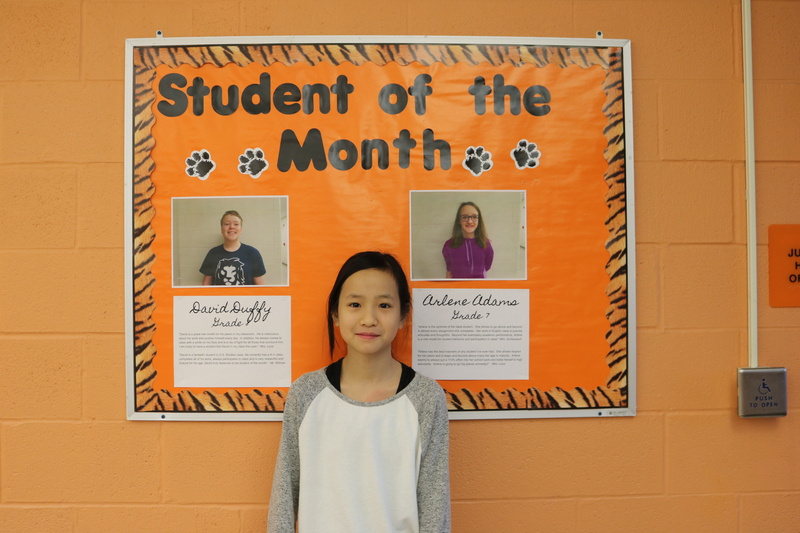 The student of the month excels in Language Arts and Reading. She is an excellent student and displays the type of behavior that should be modeled by her fellow students. She has never missed an assignment and has never earned anything lower than an A. In addition to her dedication as a student, she is also an excellent artist! The artwork she has done for her monthly journal illustrations is fantastic! 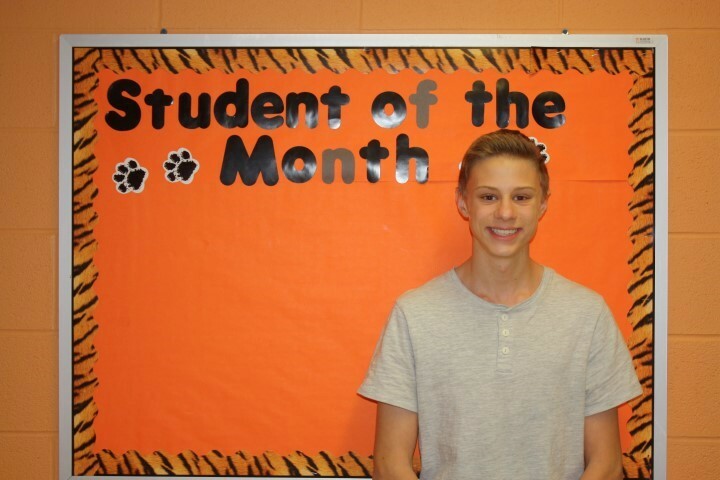 The student of the month exemplifies what a great student is in U.S. Studies class. He is hard working, respectful, participates in class, completes all of his work, and has had an A all year. He is a great role model for other students in the class to look up to. It is a pleasure to have him in my class. The student of the month is a conscientious, mature, and intelligent young man who is determined to do well in American History. This is a evident in his enthusiasm and diligence in the classroom. He participates in lass and is always willing to help others. He is a joy to have in class. I highly recommend him for student of the month. The student of the month quietly makes a difference. 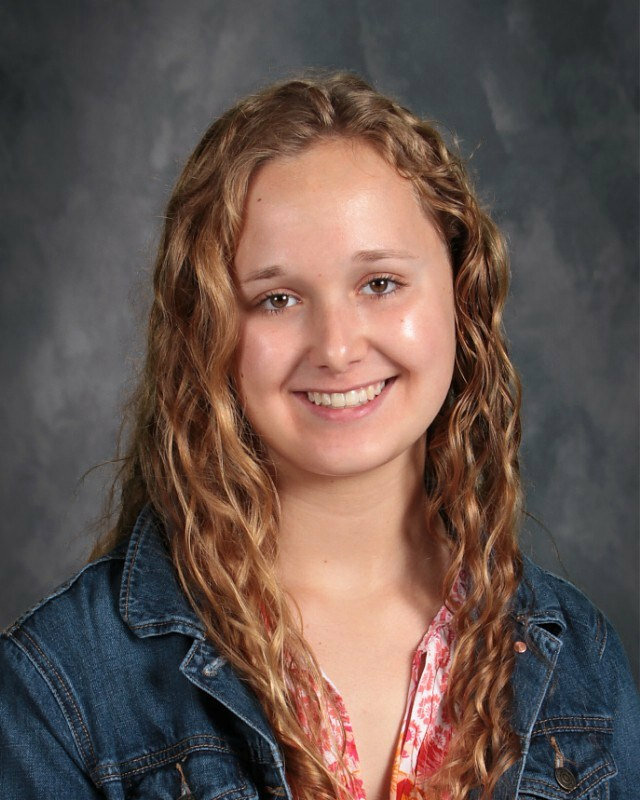 Her, along with a friend, was an outstanding contributor to the Veterans Day Program and actively and calmly participates in classroom discussions and dialogue. She consistently completes assignments and takes responsibility for her own education. The calm manner in which she presents ideas and opinions creates the dialogue essential to a democratic society. The student of the month is pleasure to have in class. She achieves high academic standards. She is a very well-mannered young woman. She assists other students willingly with classroom tasks such as helping them find their place on outline notes, searching for lost papers, and guiding them to the correct responses on daily seatwork assignments. 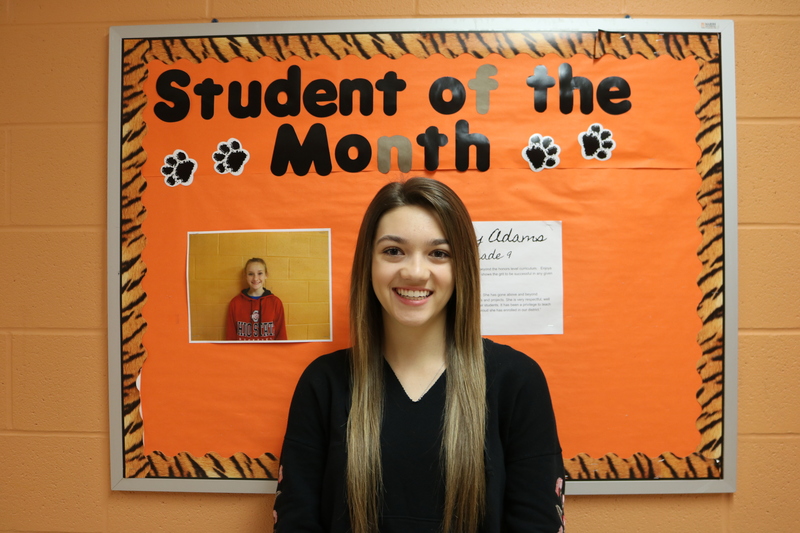 This student of the month is always helping students around her with a smile on her face. She is polite and mature, and she stays on task almost always. She completes her work on time and done with A effort. I love having her in class. The student of the month is an extraordinary young woman. Academically, she is one of the top students in my class. She is not afraid of a challenge, and is intrinsically motivated to succeed. She is an excellent role model for other students as well. In fact, her positive behavior recently influenced other students to modify their learning habits, which yielded a significant improvement in the affected students’ academic performance. She is a busy young woman who manages to balance her academic schedule with an equally rigorous athletic regimen. I am pleased to nominate her for the October student of the month her talents, hard work, and dedication are more than deserving of this special recognition and accolade. The student of the month is a student that displays the highest level of character, discipline, and attention to detail. She is self-motivated, independent, dependable, and bright. Jessie always has a great attitude in the class and contributes to an exceptional and comfortable environment. The student of the month is an absolute pleasure to have in class. She is a very hard working student and she always brings excellent input to classroom discussions. She is very inquisitive which is great for a science class. She always goes the extra mile with all of her classwork and she is always willing to help out the class. The student of the month, I feel, shows everything it takes to be the student of the month. Not only is she extremely hardworking, which is reflected in her schoolwork, she is also an excellent peer to her classmates and an excellent student to have in class. She is willing to help out another student if she or he is struggling, she always uses kind words when speaking to others, always offers positive support to classmates, and is always first to volunteer if I need assistance with anything. 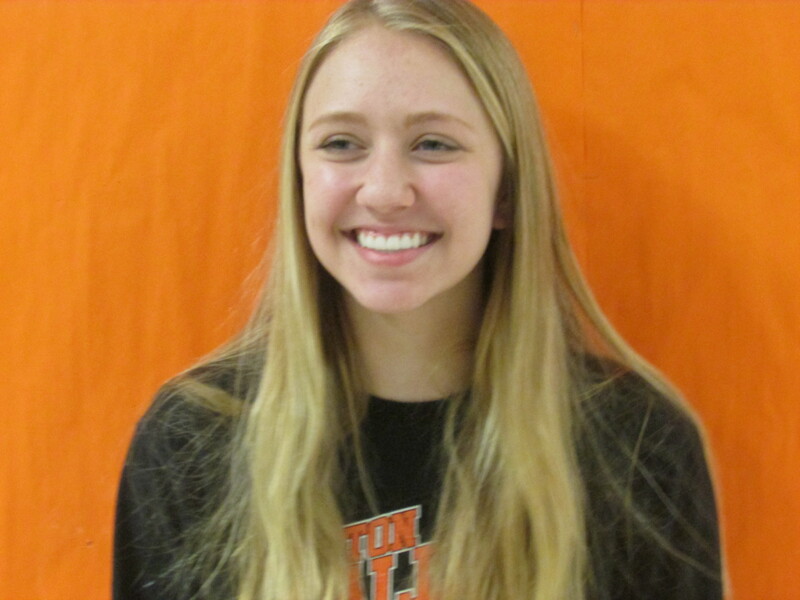 She is also a great team member when it comes to working in groups and has nothing but the utmost respect for herself, her peers, and her teachers and administrators. I believe she is a true role model for other students and will only continue to thrive here at Newton Falls. The student of the month works so hard every day in Science class. He constantly has his hand up ready to participate or share his ideas. He works with his partner and never needs reminded to stay on task. The student of the month is extremely well-behaved and comes to class prepared and excited to learn each day. He is kind and compassionate towards all his fellow students and to me exemplifies what a dedicated student with perseverance is. He is very hard-working and I have an immense amount of respect for the dedication he displays towards his school work. I am very proud of his accomplishments and thoroughly enjoy having him in my class. The student of the month has a positive attitude in class and is reliable. He takes his time following all directions carefully, asking and answering questions appropriately, staying on task, and he tries his very best on all assignments. The student of the month has maintained an A or B average the entire school year in social studies. He actively participates in class and his behavior is outstanding. The student of the month is a pleasure to have in class and I will miss him when the school year ends. The student of the month is an excellent student! He completes all of his work promptly. The student of the month has an A average in Math class. He brings all of the needed materials to class, is on-time, and works hard. 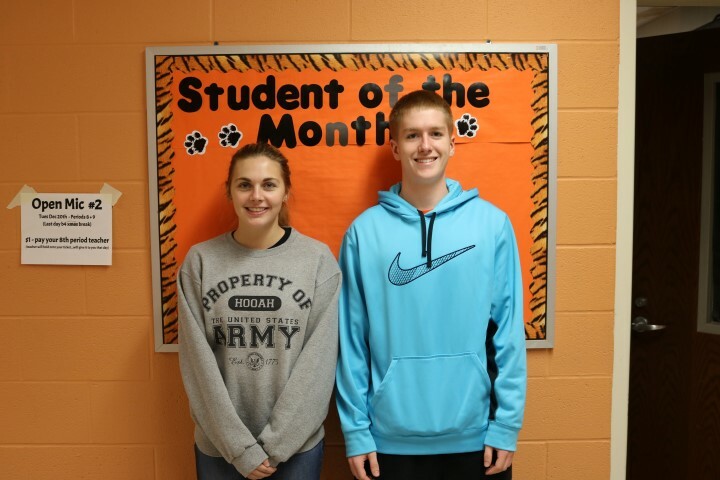 The student of the month pays attention, volunteers information, and works well with others. I have the student of the month in Health and Creative Cooking. She completes all work, is cooperative, works well with others, and is always willing to help out when needed. The student of the month has top grades in her classes, has great character, and is overall a good person. We can be proud to have her represent our school! The student of the month is always on time, prepared, and helpful. 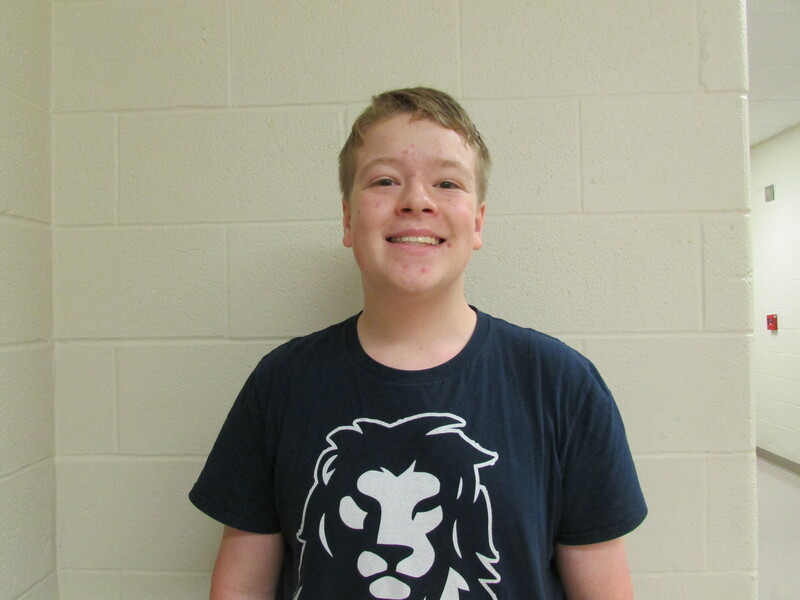 He was selected to represent the school in the All-Ohio Fair Band this summer in Columbus. The student of the month is a very hard working student. Over the course of four nine weeks she has not missed any homework assignments. She makes sure that everything is done and stays on top of her grades. She pays attention in class and she is not afraid to ask questions if she does not understand something. She is a student that others should look up to as an example. The student of the month is a model student. He is conscientious student. He achieves success by his determination to do the best he can weather it is in class or in an extra curriculum activity. He is hard-working and it shows in his grades. He gets along well with other students and teachers. He is respectful to both. I believe that the student of the month deserves this honor. 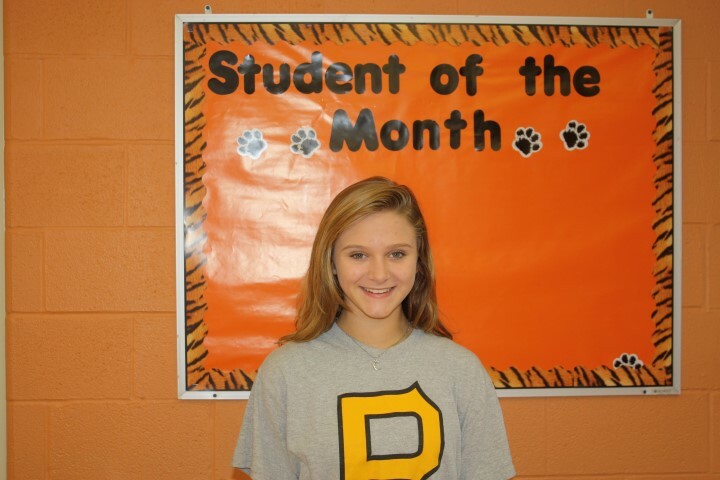 The student of the month is a gifted, talented young woman with a strong work ethic and exemplary attitude. She balances a rigorous academic schedule with a challenging extracurricular regimen with a spring in her step and a smile on her face. She is a natural leader, and her positive attitude is always infectious within my classroom. She is an excellent candidate for this prestigious honor. The student of the month is a phenomenal student. She is an extremely insightful, thoughtful, and creative student. She is always prepared and quick to assist me or any of her peers. She provides worthwhile insight during class discussions and her effort towards academics is unwavering. Her dedication to her studies and kindness and compassion towards others are unparalleled. I would like to offer my highest recommendation for the student of the month. As his physics at Newton Falls High School I have had the opportunity to witness his strong academic and analytical skills over the past year in my classroom setting. He is a highly self- motivated student. He requires very little extrinsic motivation and gravitates towards any activity that requires higher level thinking skills, analysis and challenges. His calm demeanor and great verbal skills have created a student who is naturally a leader and well respected by students and teachers alike. When the student of the month offers an analysis of an issue within class both students and staff will listen and think. It has truly been a pleasure to teach and interact with him. The student of the month has completed every assignment, on time, for the entire year. He works on homework through intervention, without being asked. He is also willing to help others when they don't understand any topic during intervention. The student of the month is very smart and dedicated to her school work. She is perfectly behaved in class and always gets a good example from her peers. The student of the month has a positive attitude in class and is reliable. She takes her time following all directions carefully, asking and answering questions appropriately, staying on task, and tries her very best on all assignments. The student of the month is one of the hardest working students that I have. She always puts forth 100% effort and uses her time wisely. 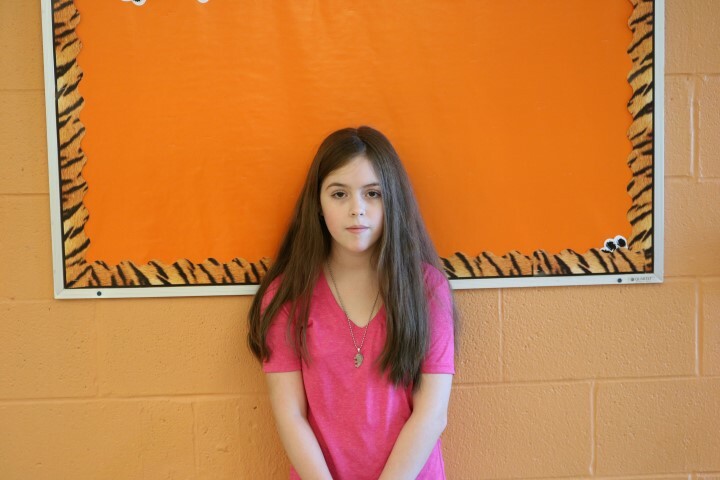 She is always kind and polite in class also is always willing to help others and does so on a regular basis. She is an exemplary student, who truly deserves this honor. I have had the pleasure of working with the student of the month for the last four years. In these four years she has grown educationally and matured throughout the years. She went from being a shy timid young girl who is now willing to ask questions if she doesn’t understand something. She will stand up for her peers when she is needed. 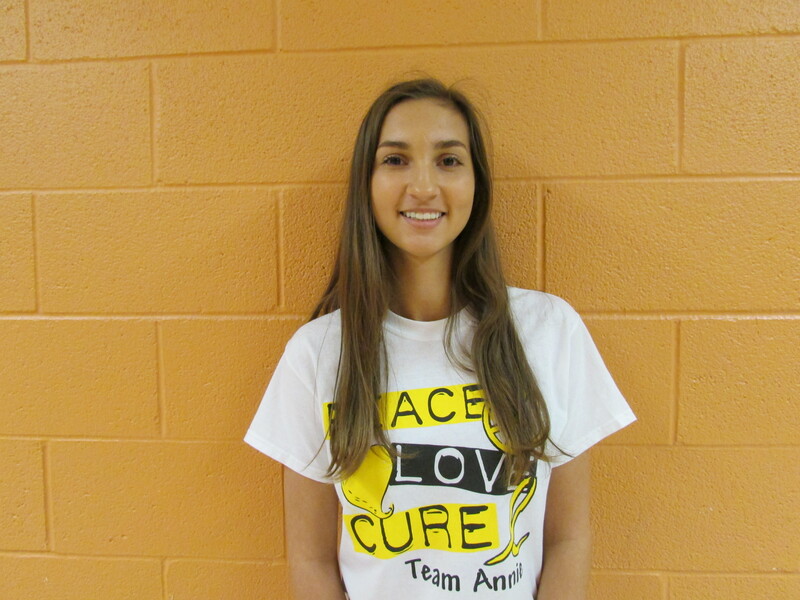 The student of the month will also advocate for what she and her peers need in the classroom. In the past she would sit back and take it all in. Now she is more active student within the classroom and is more eager to learn than she was in the past. The student of the month gets excited when she sees success in herself and when she sees that she has faltered she will try even harder to make sure she improves. She is always concerned about her grades and wants to do well in the classroom. When taking test with me one-on-one recently she verbally answered her questions as she wrote then down and was excite because she knew as she was answering she was doing extremely well. She is a breath of fresh air because she is a student that wants to achieve and tries her hardest at all times. 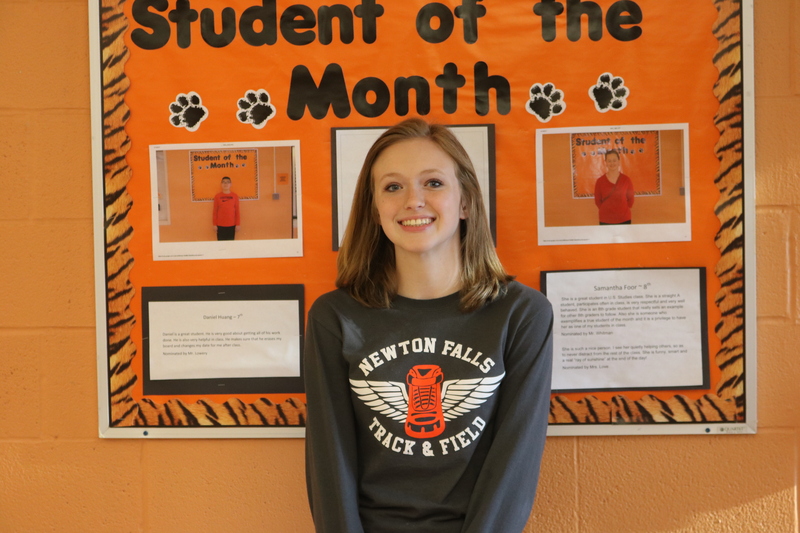 As the student of the month's physics teacher and coach at Newton Falls High School I have had the opportunity to witness her strong academic, organizational and social skills over the past two years in a classroom setting as well as in multiple extracurricular activities. She has earned the respect of the High School staff and her peers. The student of the month is a rare student, driven by intrinsic motivations to perform with evident in any understanding she chooses to grant her attention. Her dedication to self-improvement is evident in the classroom, her ability to communicate with peers and staff in nothing short of exemplary. The respect and dignity that she treats others with would be commendable for an individual of any age. The student of the month enthusiasm and optimism are contagious to all she comes in contact with. Excellent academic achievement, well behaved in class, participates in other activities. The student of the month is a very well-rounded student. She leads by example. She is a very high achiever in and out of the classroom. She is very respectful to her teachers and fellow students. 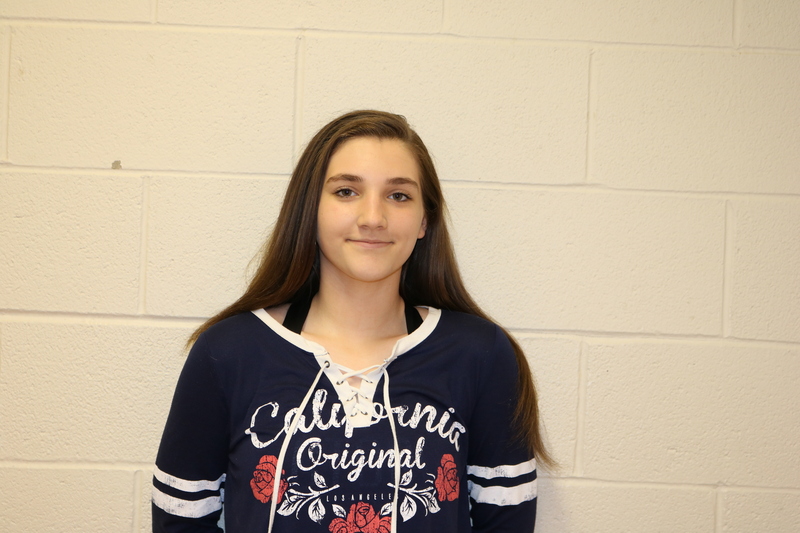 Is an excellent student, she scores very well on her studies; she represents our school very positively to the community of academically and athletically. She is a very positive highly motivated student. 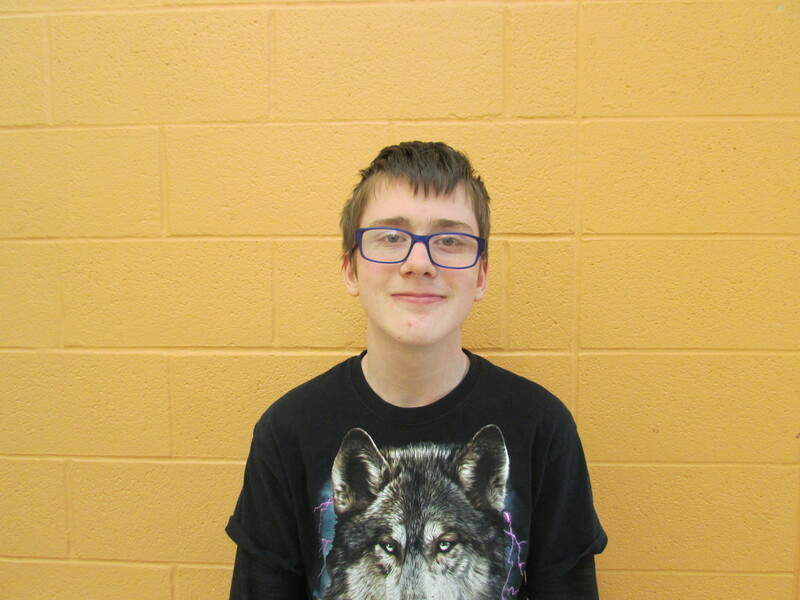 The student of the month has maintained an A/B average during all 3 quarters of this school year. She is a model student in the way she treats others and behaves in the classroom. She is an enthusiastic reader and I always look forward to hearing her talk about her current book. I have no doubt about the student of the month's future success at Newton Falls School District. The student of the month has been a model student all year long. She always asks questions if she doesn't understand a concept. She is also very concerned with her grades. She makes sure that all assignment are done well in a timely manner. The student of the month is a pleasure to have in class and a student that others should look up to as a role model. The student of the month is one of the nicest 8th graders I’ve ever had. He helps others, is dedicated to his school work, and always has a smile on his face. This student of the month is one of my most helpful students! She is always eager to assist in any way needed and always arrives prepared for class. She is an extremely hard worker who fights for participation when she can. She is a wonderful student and a huge help in my classroom. 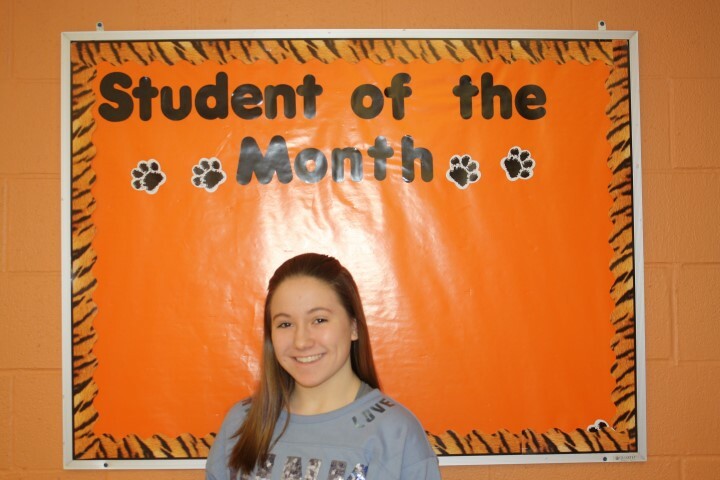 The student of the month does very well in my class, serves as a student aid, participating in extracurricular activities and is taking college classes at Kent State. She has found time to serve in student government. She is the exemplar for a well- rounded student who takes all pursuits with equal purpose and dedication. She has consistently added to the classroom environment by facilitating debates and conversation about the most important subjects our nation faces. Her contributions to the Veterans Day program in the fall will stand as a pinnacle of excellence for the class of seniors. The student of the month has been an excellent student all year long. She is a very driven to succeed in my class. All of the work that she does for me she has spent time thinking through and making sure it is up to the standards of my class. She is very good at critically thinking through problems, and if something comes up that she doesn’t understand she isn’t afraid to ask questions. 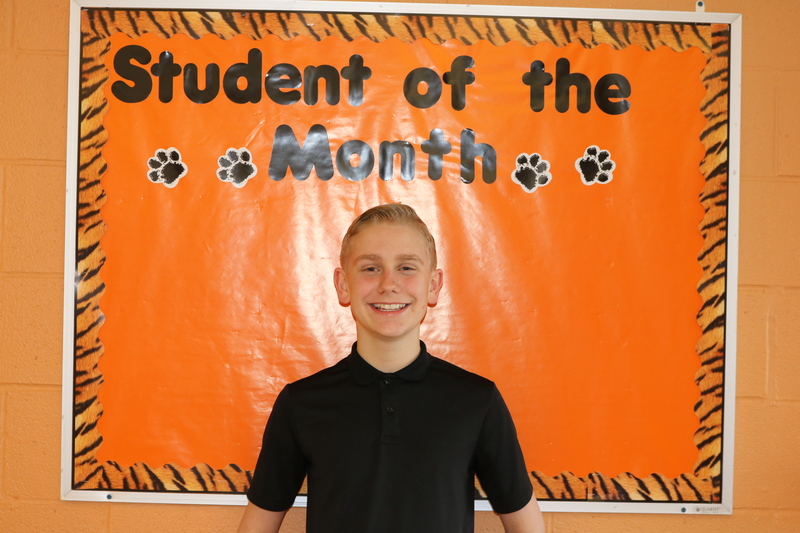 The student of the month is an excellent example of the junior high student, he does very well academically, and he is a member of the student council and participates in the instrumental music program. He is a very well – mannered respectful young man. He serves as a positive role model for his fellow students. The student of the month is a wonderful student in my classroom. He has never missed on assignment in the two years I have had him in math. He is extremely polite and is very respectful of teachers as well as his peers. I have watched watching him help others when those students were experiencing difficulty in math class. Although he is extremely bright in math he is very humble. I believe he sets a terrific example in how to conduct oneself as a successful eight grade student. The student of the month is a quiet but diligent student. He is a model for good classroom behavior. He works very hard to maintain his grades and always exhibits 100% effort. He is a wonderful student and I feel lucky to have him. The student of the month a ninth grade student had his schedule changed for English class after coming back from Thanksgiving break, has adjusted very well. He does all of his homework and seeks out help when needed. He was very nervous going into a new classroom; however he was giving speeches and participating within a week of starting his new English class. I am very proud of his courage and hard work. He takes his time following all direction, asking and answering questions appropriately and stays on task during class. The student of the month is always a pleasant addition to the classroom environment. He also puts others at ease with his demeanor and easy candor in the classroom discussions. The student has found a way to balance fun and work in a classroom setting while not interfering with the progress of the students within the class. He applies himself to tasks with high level of creativity and positive outlook that makes teachers want to find new ways to instruct. The student of the monthis an excellent student. He works hard in Spanish class, is respectful, and is a role model to his fellow students. In three years of Spanish he has never missed a homework assignment and always earns good grades. The student of the month has had perfect attendance and has maintained an A in Language Arts and Reading for the past 12 weeks of school. He also has demonstrated leadership qualities in the classroom as well as the ability to problem solve. For example, when he has been assigned to work with a group of students he delegates work and has encouraged students to participate to the best of their ability. His enthusiasm for reading has also been a trademark of his exemplary performance in the classroom. 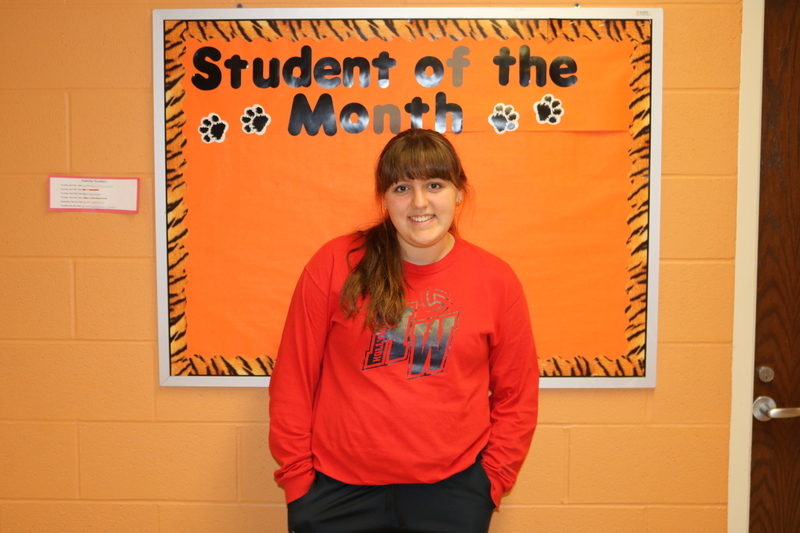 The student of the month has made an astounding turn around in her academic life. I had her last year, during that time she missed dozens of days, failed to complete numerous assignments and expressed a general disinterest in school. This year as an eighth grader she has cut her absents way down (only 5) has brought her grades up to B's and has taken a genuine interest in her education. When I praise for her good efforts she modestly smiles at me, she has matured greatly and now understands the importance of school. She answers questions in class, asks for clarification as needed and has taken a very proactive approach to class work. I am very proud to have her in my class this year. 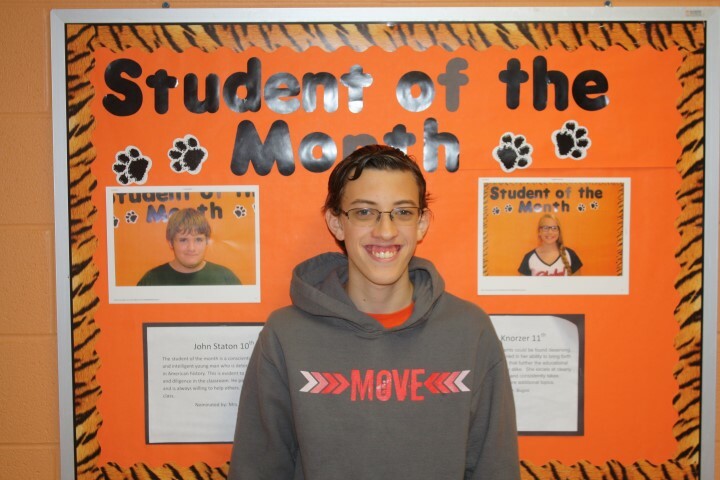 She deserves to be student of the month based on her overall improvement here at Newton Falls. This award will be like a spring board for her, it will show her that work truly pays off. When I think of an exemplary student , the student of the month epitomizes the characteristics of a "student of the month". She is one of the hardest working and reliable students I've had my 9 years of teaching. If she makes a mistake, she is eager to correct it and is willing to help anyone in need. She has creative ideas and I can always trust she will give 110%. I have known the student of the month for 6 years now and every year she impresses me with her work ethic and her determination to be the best at everything she tries to accomplish. She is a leader in my classroom and a leader as an athlete. She is always prepared to challenge herself to master the content we are covering in class. She is a great member of the Newton Falls community and displays great when representing Newton Falls attitude and manners. As the nine weeks continued, the student of the month started to ask more questions during intervention. She started to seek help so she was doing problems correct. She has also redone 12 assignments this nine weeks, NONE of them being zero re-dos. She started gaining confidence in the classroom, by raising her hand and participating more. As of October 21, the student of the month has a 4.0 for this year. He is a leader and a role model in science. He is always assisting others. He is kind, gentle and humble. He is independently motivated. "He is AWESOME!" said by Mrs. Love. 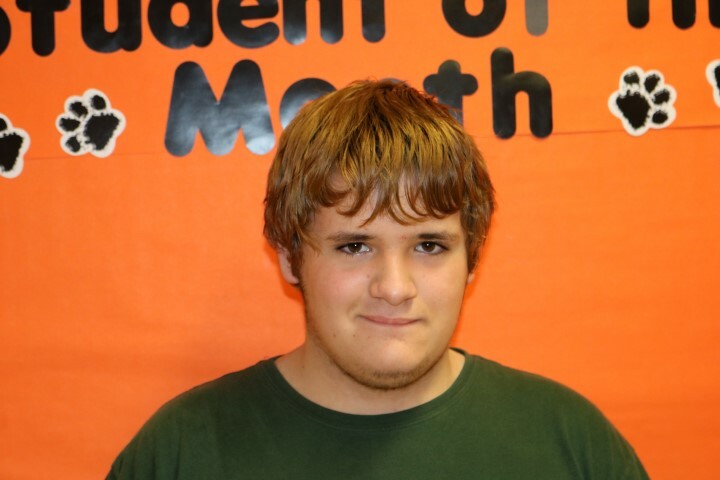 The student of the month completes all work, participates in class and always displays a positive attitude. She also comes over to my classroom sometimes during her 8th period study hall to help answer questions of my algebra class. My 8th period class is large (for general), so giving 1 on 1 attention is difficult on some days. Miss Eaken willingly comes over to help because she did very well in algebra last year. 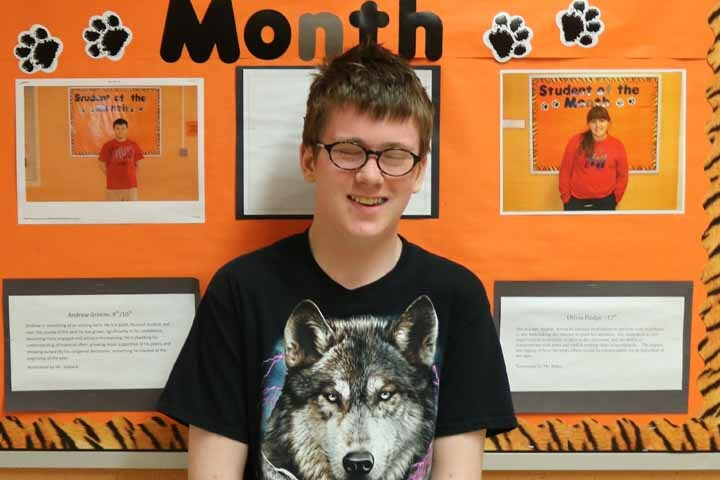 The student of the month is an outstanding student who promotes a positive classroom environment. She engages faculty and student in the same dignified manner, asks questions and adds comments to the classroom discussions on a daily basis. Her strong academic skills are represented in her grades as well as her character. 1. Perfect attendance and on time for all classes. 2. No discipline referrals during the month for attendance or behavior. 3. Must be nominated by their teacher for: academic improvement, behavioral improvement, or service to others.